Online backup software for service providers is the reliable method of keeping data copies offsite. Handy Backup provides cloud backup software for service providers of any popular online storage service, as well as allows expanding the list of these tools by the partnership program. Some service providers such as 4shared and Xref for AutoCAD have dedicated plug-ins to use with Handy Backup. These features utilize cloud-specific API presented by providers as a part of the partnership program. Any partner of Handy Backup can settle its own plug-in as a software feature. If you want to have a dedicated plug-in for your online backup service, please register as the Handy Backup partner and then contact our sellers or tech support to tell them about your wish. We are glad to make a new plug-in for our partner, to further provide its service! Online backup for service providers can also configure an access to personalized cloud storages for online backup, allowing using the WebDAV protocol to transfer files to and from their clouds. Therefore, if you have no plans for a dedicated plug-in for your service, you can still use Handy Backup via WebDAV. Customization. Rebrand Handy Backup for your business needs! Turn Handy Backup into your trusted cloud backup software for your service provider, making it in your unique feel and design to blend with other products in the line. Scalability. Apply Handy Backup to separate computers, network nodes and entire infrastructures by selecting the appropriate online backup solution for a particular provider infrastructure or a particular goal. Scaling Handy Backup to a network is a simple thing! Data Protection and Private Cloud Operations.. Handy Backup works perfectly with private cloud backup solutions (e.g. OwnCloud), and provides a good quantity of data protection tools, including encryption, secure transfer and calling for external software to protect online backup. Silent Running Mode. 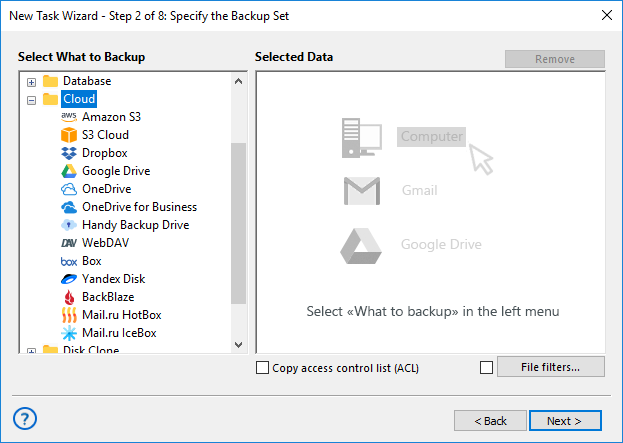 Handy Backup can operate as Windows service, hiding the GUI from users. Network Agents of Handy Backup always run as services. 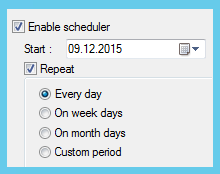 This option can be useful to eliminate user distraction, after tuning up all backup operations to run smoothly. High Speed. Backup solution for hosting providers shows very high performance marks, due to extended multi-threading, optimizing network operations and intuitive, classical-looking user interface. Any solution is resources-friendly and use as fast methods of data moving as possible. Compatibility. Designed for Windows, the software supports all the native versions of Windows include Windows 10/8/7/Vista, as well as all server products such as Windows 2012(R2) and Windows 2008(R2). It can also back up Linux workstations and servers. We are open for partnership with any service providers. If you are interested, join us as the full-scale Handy Backup partner! Register as our partner, and get bonuses and benefits of this partnership according to your business. Stay with us, to build your future on a sturdy and handy backup strategy! My company has been testing backup software for the last 13 years and we have found Handy Backup the only application to do what we want and when we want without causing any problems. We now sell this application to all our users and recommend it to everyone.